BROOKLYN, N.Y. (CNS) — Two Brooklyn diocesan priests with years of institutional and pastoral experience were ordained auxiliary bishops to serve Brooklyn and Queens at St. Joseph’s Co-Cathedral July 20. It was the first episcopal ordination held at the site. Brooklyn Bishop Nicholas DiMarzio was the consecrating bishop for the ordination of Bishops James Massa, the moderator of the curia, and Witold Mroziewski, pastor of Holy Cross Parish in Maspeth. Assisting him were co-consecrators Bishop William F. Murphy of Rockville Centre and Brooklyn Auxiliary Bishop Raymond Chappetto, who is vicar general. Presiding at the afternoon liturgy were Cardinal Timothy M. Dolan of New York, and Cardinal Theodore E. McCarrick, archbishop emeritus of Washington. More than 35 bishops attended, including Archbishop Bernardino Auza, the Vatican’s U.N. nuncio;and two Brooklyn natives, Bishop Gerald M. Barbarito of Palm Beach, Florida, and Bishop Edward B. Scharfenberger of Albany. The line of procession also consisted of several hundred priests, deacons, men and women religious as well as representatives of lay organizations and groups with other religious affiliations. During the two-hour ceremony, Archbishop Carlo Maria Vigano, apostolic nuncio to the United States, read the proclamation by Pope Francis declaring the two men as bishops. That was met with applause, signifying the congregation’s approval. Other significant moments included the chanting of the Litany of the Saints while the candidates lied prostrate in the sanctuary, the imposition of hands upon the heads of the new bishops, the anointing of their heads with sacred chrism and the presentation of the miter, crosier and bishop’s ring. Before the final blessing, the new bishops were escorted around the co-cathedral as they bestowed their first blessings upon those in attendance. 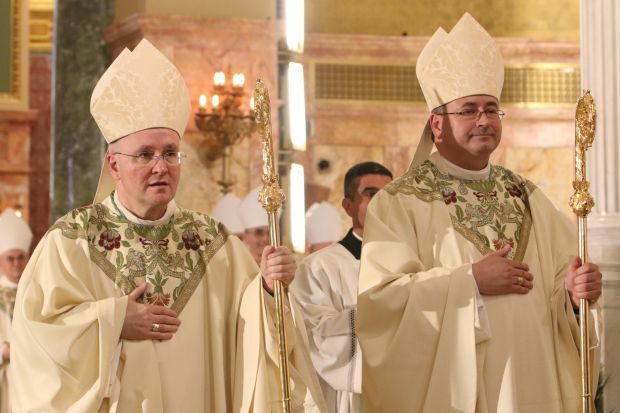 “Bishop DiMarzio, I say from the depths of my heart, thank you,” said the new bishop, who was ordained a priest in his native Poland in 1991 and soon afterward arrived in the Brooklyn Diocese. He began serving in pastoral ministry in 1992 and was incardinated into the diocese in 2001. At a news conference held immediately before the ordination, Bishop Massa said he was ecstatic to see so many friends and family coming together for this day. One of those friends who had arrived more than an hour before the ceremony was Susan Valenti, a parishioner at Holy Name of Jesus Church in Park Slope, where Bishop Massa was an administrator. “He is very sweet, very holy. I’m thrilled to be here today,” she told The Tablet, Brooklyn’s diocesan newspaper. Msgr. Anthony Sherman, pastor of St. Anastasia in Douglaston, said he was honored to serve at the ordination of his friend Bishop Massa. They had worked together in Washington when Bishop Massa was executive director of the U.S. Conference of Catholic Bishops’ Secretariat of Ecumenical and Interreligious Affairs from 2005 to 2011. At that time, Msgr. Sherman was associate director of the USCCB’s Secretariat of Divine Worship. “It is wonderful to see somebody so gifted and so gentle to be ordained to the episcopacy,” said Msgr. Sherman. He also offered some advice for the new bishops. Ruben Martinez, a member of Nativity of the Blessed Virgin Mary Parish in Ozone Park, who came to the Mass representing the Knights of the Holy Sepulchre, was happy to be there for Bishop Mroziewski, also a member of the order. “It is a great day in New York, not just in Brooklyn or Queens, but all of New York because this priest — bishop — will do a wonderful job,” he said. Rabbi Moses A. Birnbaum, from the Jewish Center of Kew Gardens Hills in Flushing, said Bishop DiMarzio had invited him to the Mass but he had come especially to support Bishop Mroziewski, with whom he had been involved in a Polish-Jewish dialogue. “This is a tribute to the Polish-American community. He is a wonderful man,” the rabbi said, recalling his help when different groups worked together to change the name of a road near Holy Cross Church in Maspeth to John Paul II Way.